Ditched enclosures, namely the large ones, are some of the best contexts to developed research on mobility, for they congregate numerous evidences of interaction and movement of people, animals and objects. At an Iberian scale, Perdigões is now one of the main sites where this research is being developed. There is a Portuguese Science Foundation project dedicated to this specific topic: “Mobility and interaction in South Portugal Recent Prehistory: the role of aggregation centers”. In this project participate the research unit of ERA Arqueologia, the research centre ICArEHB of university of Algarve and the laboratory Hércules of Évora University. But this research has a wider projection, for this project is in articulated collaboration with several others related to the same topic. We also integrate the project “Beyond migration and diffusion: peoples and technologies in prehistory”, financed by the Australian Research Council, and involve Era Arqueologia, the Australian National University, Griffith University and the Centro Nacional de Investigatión sobre l Evolución Humana. The goal will be research and compare mobility patterns between Prehistoric Iberia and the Pacific Islands. Furthermore, we are establishing a partnership in this topic with another FCT project: “Beaker origins: Testing the hypothesis of late Neolithic dispersals from Iberia using both ancient and contemporary mitochondrial genomes” developed by Minho University with the collaboration of the doctoral scholarship programme at Huddersfield University (UK) entitled Genetic Journeys into History: The Next Generation (running 2015–2020). Finally, we are engaged in other projects in phase of application, namely two on diets and mobility of animals in Iberia and another that will join the European Atlantic façade, “6,000 years of Farmers and Food: Reconnecting Atlantic Heritage” (working title), that will join institution from Ireland, Scotland, Wales, England, France, Portugal and Spain. 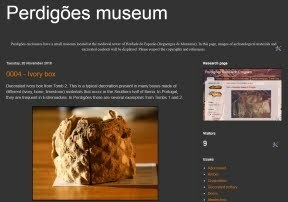 The participation of Perdigões complex of enclosures in all these projects, some of them already with preliminary results, puts it in a unique position (in Iberian terms) in the context of the actual focus of research in mobility in Prehistory at an international level. But this is the result of the way the Global Program of Research of Perdigões was conceived and is being developed.